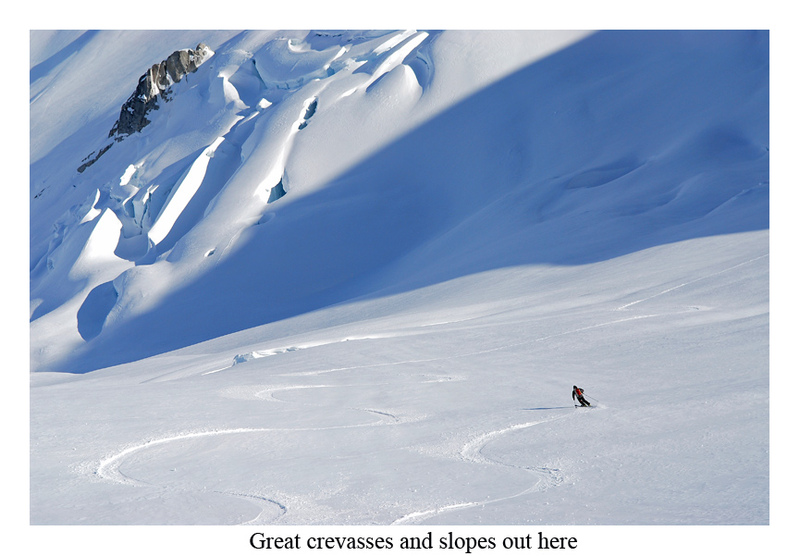 John Baldwin wrote a wonderful guide book called ‘Exploring the Coast Mountains on Skis’. After several years working on a new edition, I was happy to get a copy. Ever since, I’ve been staring at it, collecting ideas for future trips. 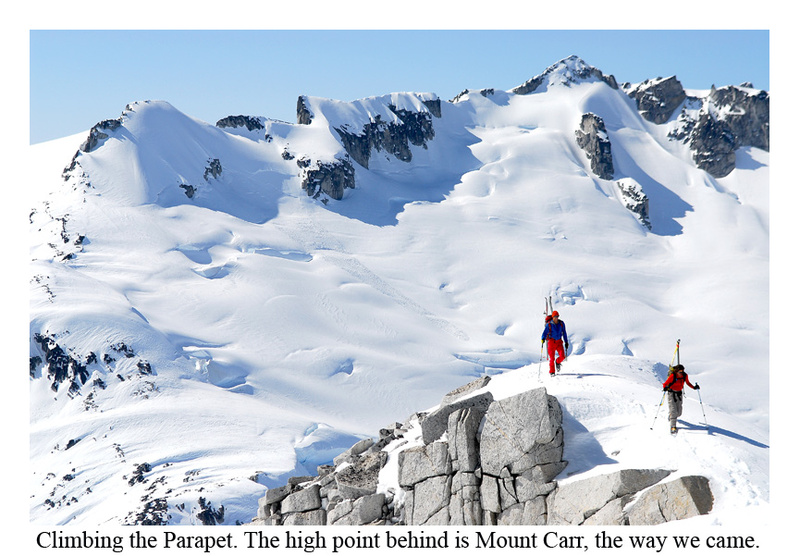 Catching my eye, one mountain in particular looked spectacular on paper as well as during a recent excursion to Castle Towers and Mount Carr – and that is Mount Garibaldi! 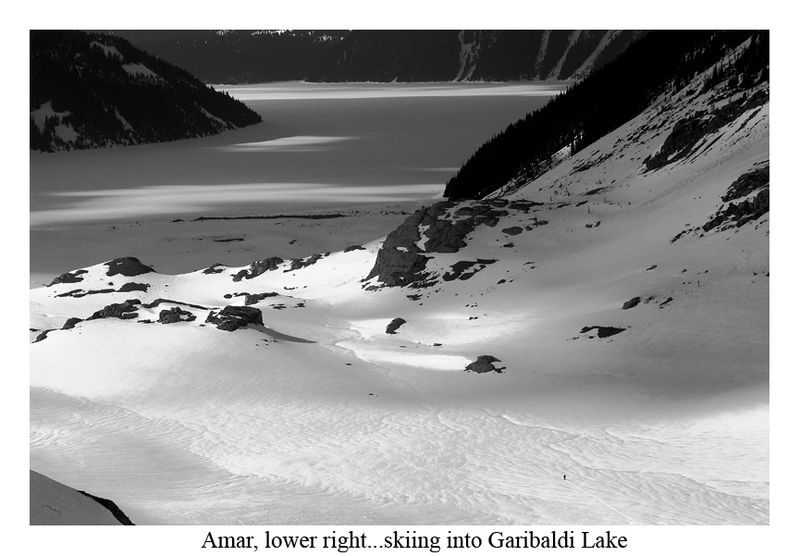 From the town of Squamish and nearly every corner of Garibaldi Park you can see it. 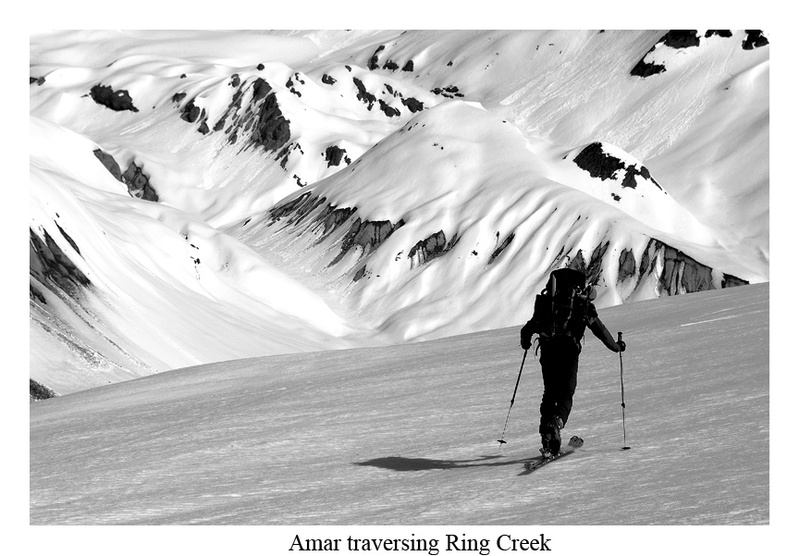 Dreams of the encircling rivers and valleys, peaks and ridges, open sky and ocean I would witness from her, well, that encouraged me to join Amar, who for those that don’t know, is on a quest of his own. 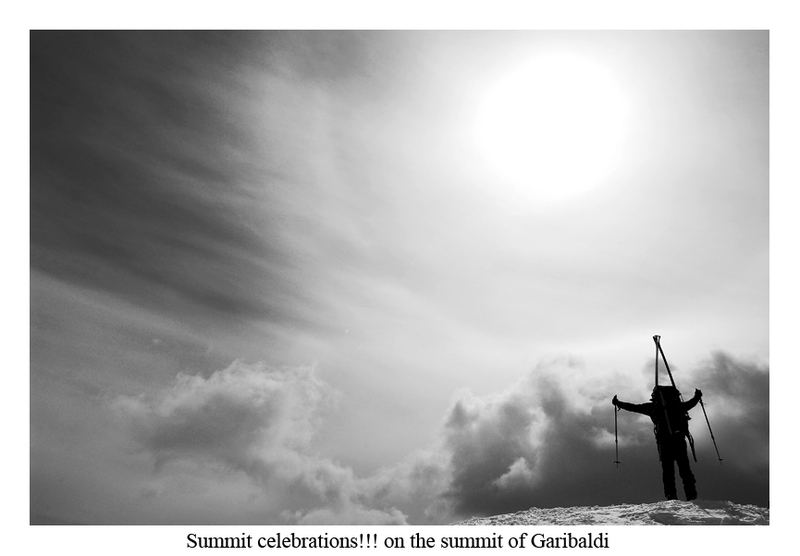 He hopes to publish a book on the Cascade Volcanos (You can see his efforts so far on http://www.skimountaineer.com) and Garibaldi has long been on his list. There’s nothing I hate more than driving. I feel half the effort of any climb is getting there. Simply stepping out of the car and putting on a heavy pack is a relief! Without even beginning, I realized that something was missing – the dulled red of my 10 year old Scarpa boots weren’t to be found! Now I was freaking. It was then my mind retraced their journey and recalled my taking them out of my car and setting them on the street near Amar’s house in downtown Seattle. Through the hours that’s where they’ve remained. Did I mention that I even dislike being in a car, let alone the actual, god forsaken driving of it! An idea hatched. We’d drive to Squamish and see if they rented boots. Amar had succumbed to the conclusion that we’d be in the car all day, returning past dark with my own boots in hand to the trailhead. This was prophetic. At the shop, the pretty girl told me, “No, we don’t carry boots, you could try Whistler.” My face must’ve been awash with disappointment when I left the shop. There, a fellow skier whom we’d met an hour earlier with his family up at the Diamond Head parking lot had been just leaving the very same shop! Finding out our predicament, he offered, “You can use my ski boots.” Going to his car, he pulled out a spare pair of tele boots his son had used. They were size 11. He asked my size and I said I wear an 8.5 shoe, but usually get boots a size big. Still wet from their trip, I stuffed my foot in and formed a convincing smile, “They’ll work.” With a handshake, we parted ways with a promise that I’d drop them off at the end of the week. It was then I realized how much Canadians just ROCK. Circa 1997 Terminator II's in hand, I set off with my heavy pack, shooting to arrive at Elfin Hut before dark. Seven miles later we arrived at Elfin Hut to its one resident, a much different scenario compared to my last visit. Then, there were dozens. Cara was nice and we visited for a few hours before going to bed. Without TV and other distracters, it’s great to actually get to know people. That’s one of the reasons I love the mountains. 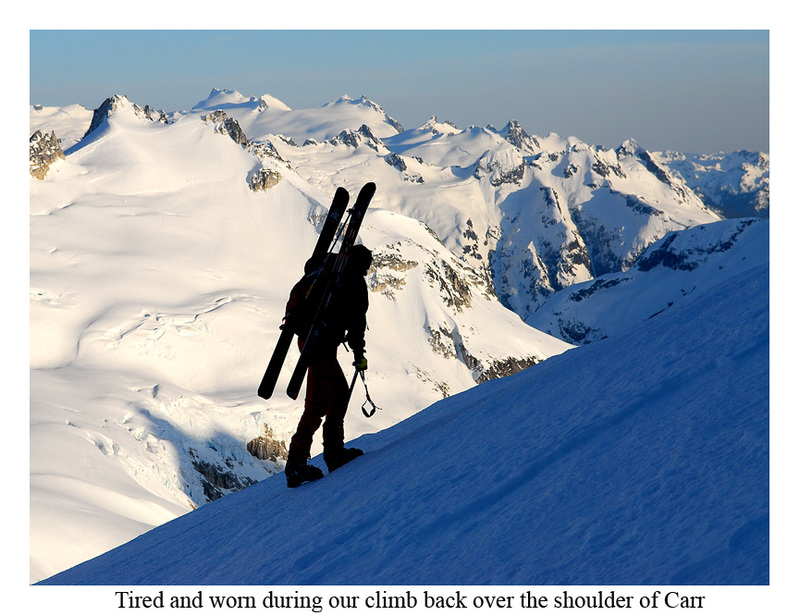 Early morning ticked away the minutes as our skis creaked and groaned their way up toward the Gargoyles. A blue sky day with some haze hung over nearby mountains and the cool breeze of the descent to Ring Creek was very satisfying. Overhead, Atwell Peak loomed. 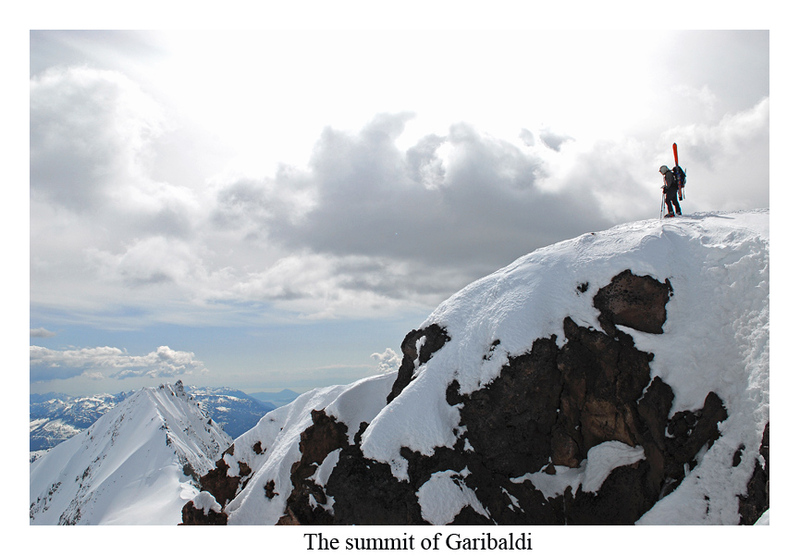 It’s the 2nd tallest summit of the Garibaldi Massif. The progress was very easy, a fact I could get used to. 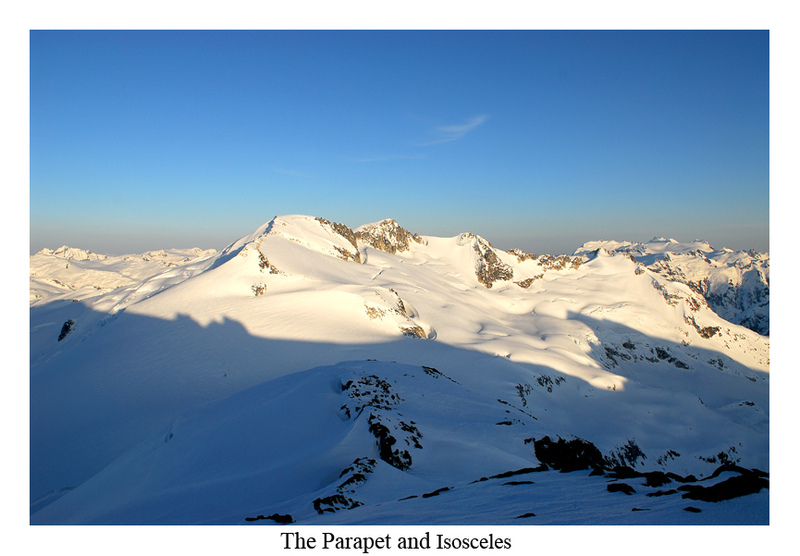 Around the corner we arrived on the Garibaldi Neve, comprised of the Bishop and Warren Glaciers. 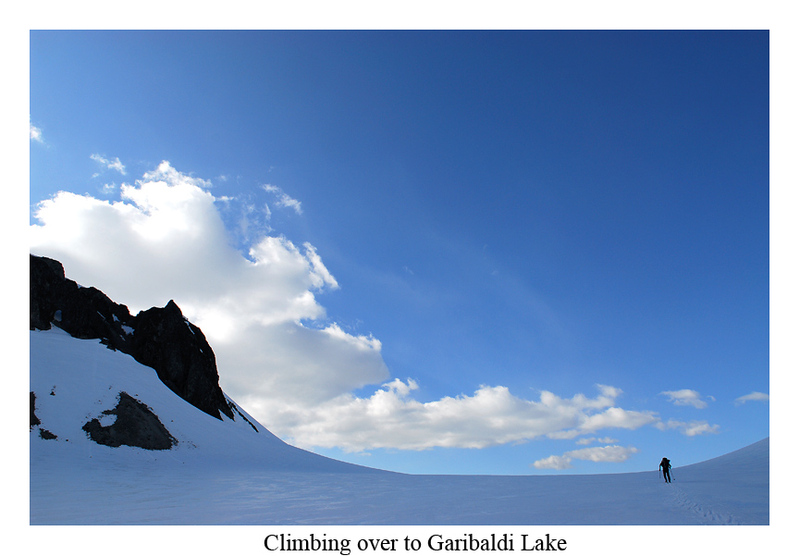 We made steady progress to a high point where we dropped our extra gear off for the climb of Garibaldi. What remained was about 2000-ft. Nothing was sustained for long even after we surpassed the bergschrund. Above me was a few hundred feet. I kicked good steps for Amar and when I topped out waited below the summit and let him tag it first. 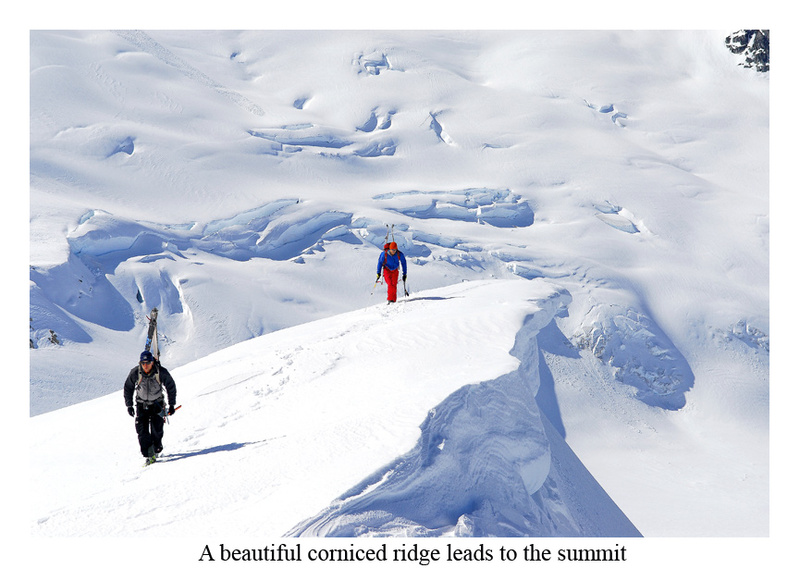 I’m usually not so much for summits, more concerned about good ski routes. This doesn’t mean I’m not thrilled all the same to top out cause I am. Leaving the summit is like saying goodbye to a friend I will never visit again or at least not for a very long while. You want to keep looking backward over your shoulder for one last farewell, one last look. And while the ski wasn't anything special, the place was. I'm usually not much for climbing peaks more than once. That doen't mean I don't. It's just my greatest thrill is seeing over that next crest into a place I haven't been. Swelling up in me desires to explore and discover. Yeah, that really gets me going. 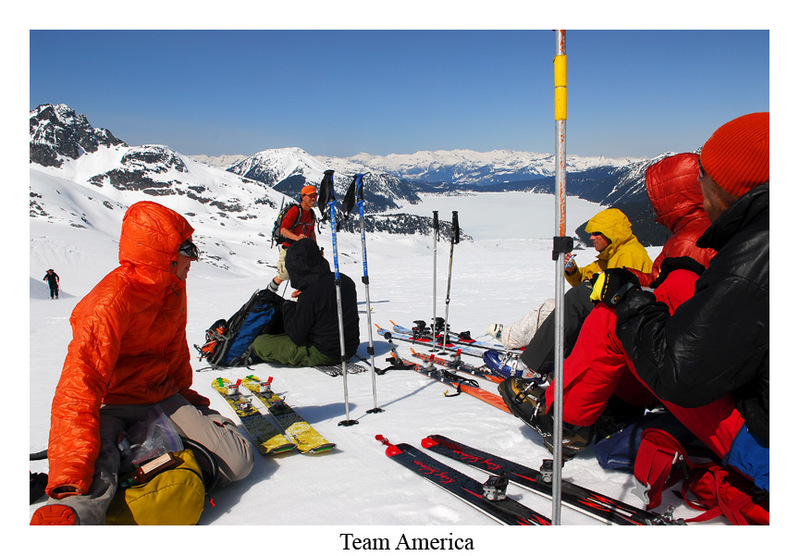 We picked up our gear after descending from the top and crossed onto the Warren Glacier. Through a few crevasses, we had to walk lightly, but nothing too scary. 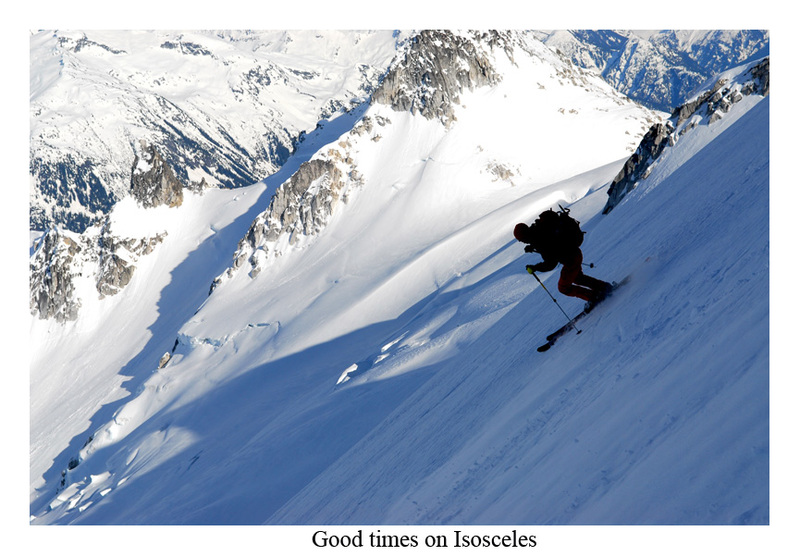 More marginal skiing led from there down to a long, flattish uphill, which we were able to climb without skins. It was then that the haze had finally broken. 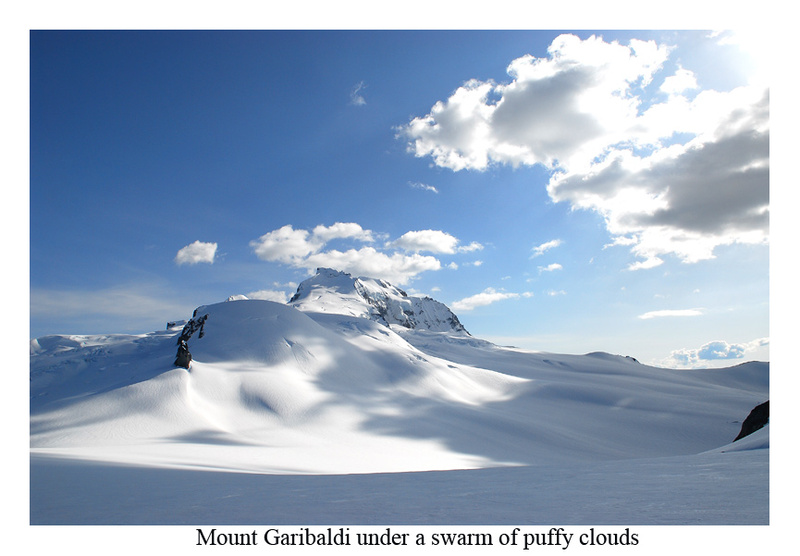 With blue shining through puffy clouds and shadows swarming the slopes, it was as if Garibaldi had become animated by the shift of dark and light. As we reached the pass, I looked back over my shoulder for the last time. 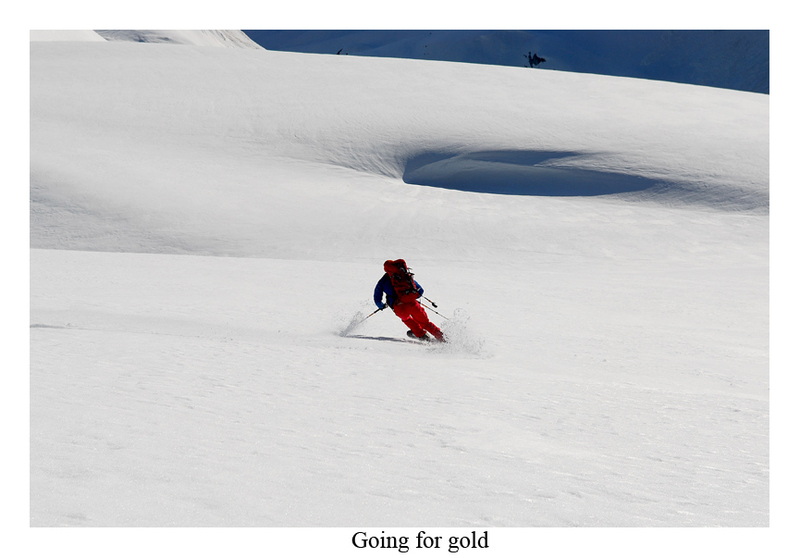 For the next several thousand feet, the snow was wonderfully settled and soft enough to carve turn after turn. There wasn't much stopping here, not even when I arrived at the shore of Garibaldi Lake. I wanted to keep moving. Since Amar needed a short break, I waited, but as soon as we began moving again, I was off. The ice on the lake was fast! Several kilometers went by with a few heavy breaths and momentary stops on shaky legs. At the cabin one familiar face was waiting. Hannah had come in a different way, preceding Sky Sjue and others. From her I discovered they would be showing up later that night. The following day would be epic. Sleep was interrupted by several familiar faces and names. A long rest meant a late morning. There was no hurry to get out before the snow softened. Sky had a plan of attack. After hearing it, I tried not to think about it. There was work before me, but nothing compared to what Andy Traslin was to endure. 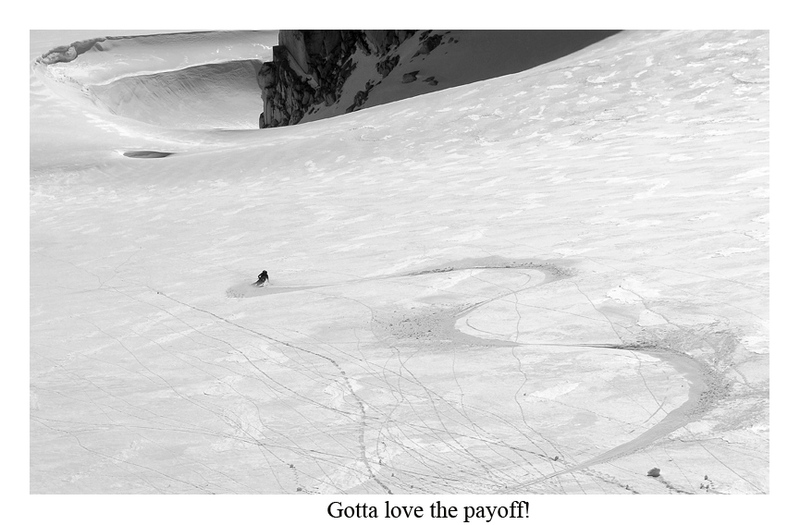 He had skied in the 9 miles to the hut that morning and planned to ski out that night in time to get to work by 6am. Little did he know what he was in for. Our group broke up after only a few thousand feet of climbing. Hannah, Sky, Amar, Andy and I set out on our own, climbing another few thousand feet to the summit of Mount Carr. Last time I was there, the haze was so thick, I could hardly see over. Now it was a mix of blues that would make an artist blush, embarrassed for his lack of paint to compare. 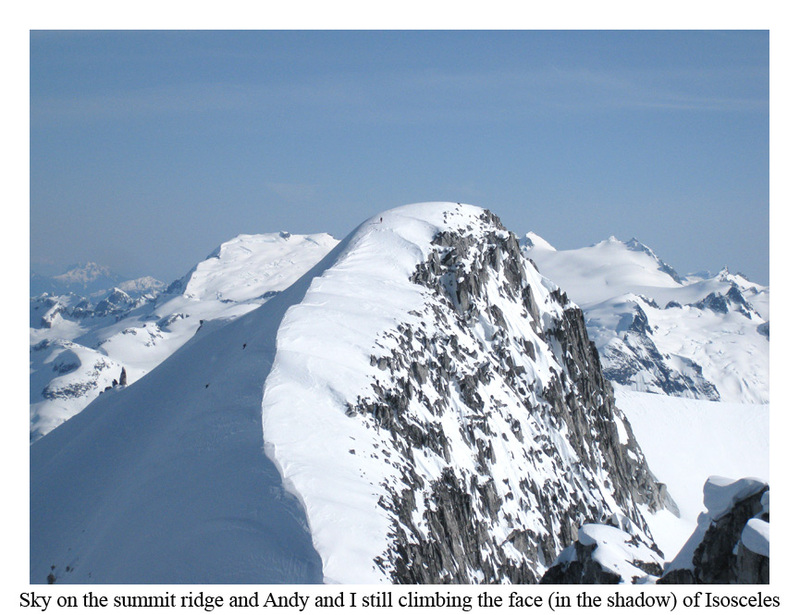 We dropped off the East Face and descended opposite of what we had climbed - committing to a long day. 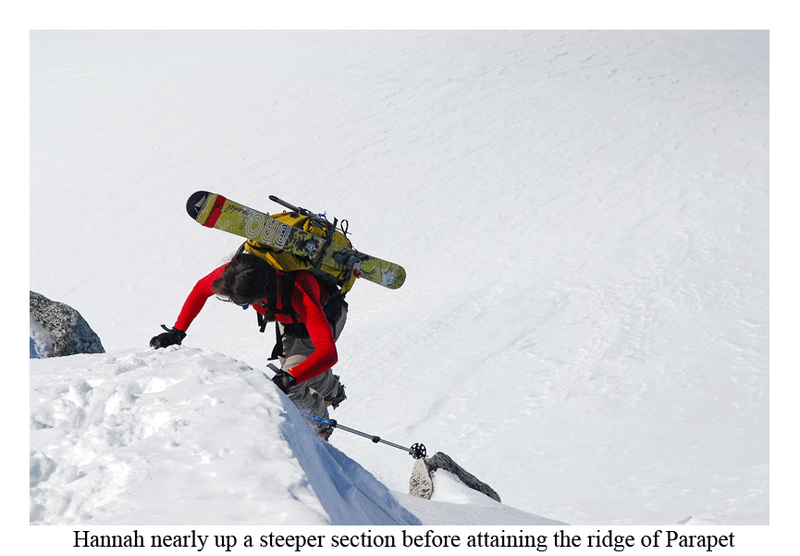 A few steeper headwalls greeted us, spicing up the ski. 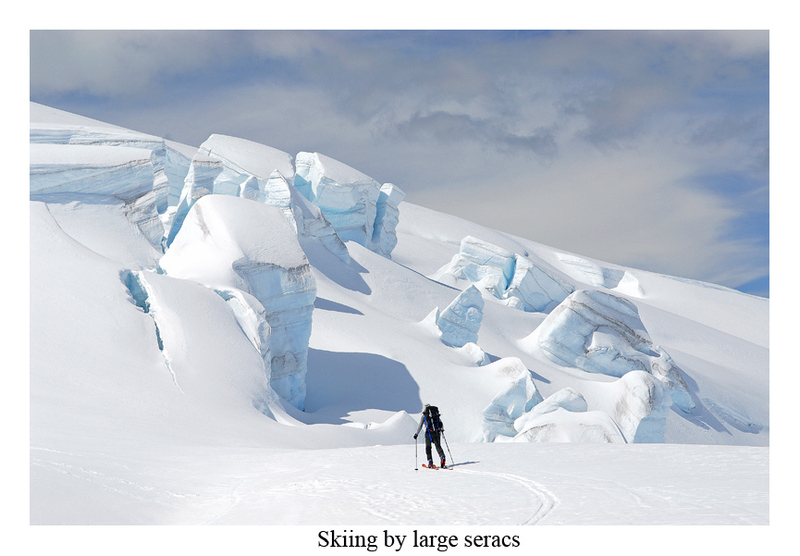 While down on a flat expanse of snowfields, so many mountains greeted me. Hannah and I had been debating about what mountains were better, the Cascades or the Coast Mountains? Yet how do you compare pretty women? I like them both and will happily spend my time with either one that will have me. 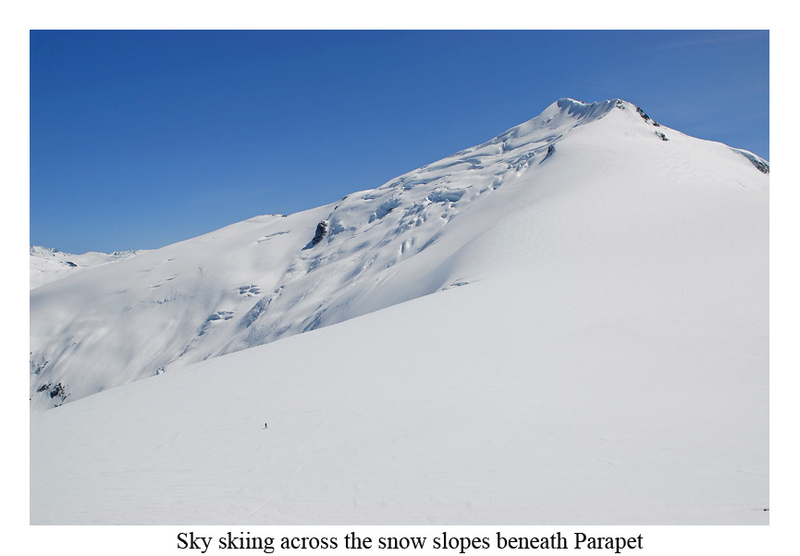 Climbing Parapet began on a gentle slope and concluded on a steep finger of snow, bringing us to a gentle summit ridge overhung by a medium sized cornice. Deeper snow on the southwest face was not as easy to climb, but we reached the summit soon after. 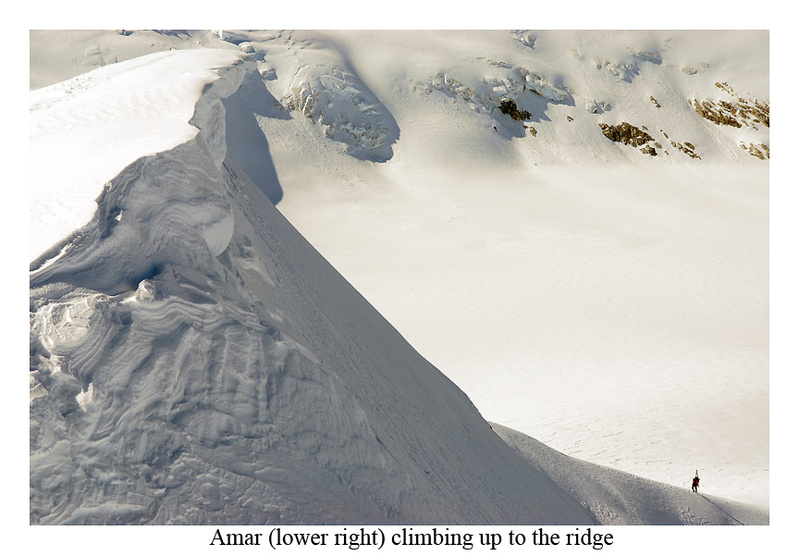 We had thought Amar was done for the day, but he kept coming, greeting us at the summit. Sky wanted more. It was already 4:30 or thereabouts and I was tired and scared looking over at what he wanted to do next, the NE Face of Isosceles. It appeared steep and very icy. Andy and I stood by and watched as he skied off the edge, made a few steep turns and flew down the glacier, another obstacle to finishing an already long day. 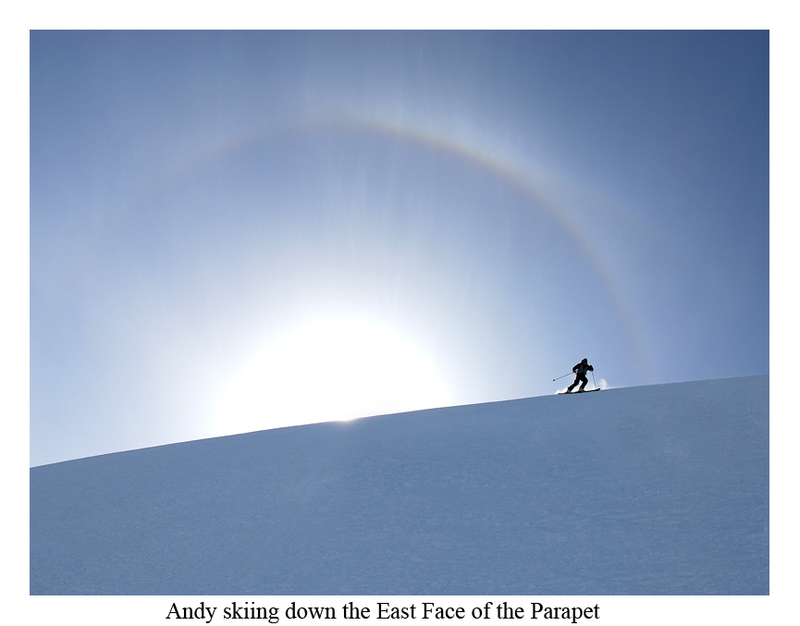 By then I was dead set against going, but watching him take his skis off and seeing no reason not to go have a look, I told Andy, "So, you want to go?" A long pause, "Yeah." We both pushed off the edge, leaving Hannah and Amar on the summit. What scared me from going was icy snow. Once reaching the base, we discovered that it wasn't too bad to ski. It certainly wasn't "...two levels up from bad," as Sky put it. Perhaps for him. I'm more mortal than that, plus I have borrowed size 11 tele boots on 8.5 feet. Still, what we had skied throughout the day had grown my confidence. 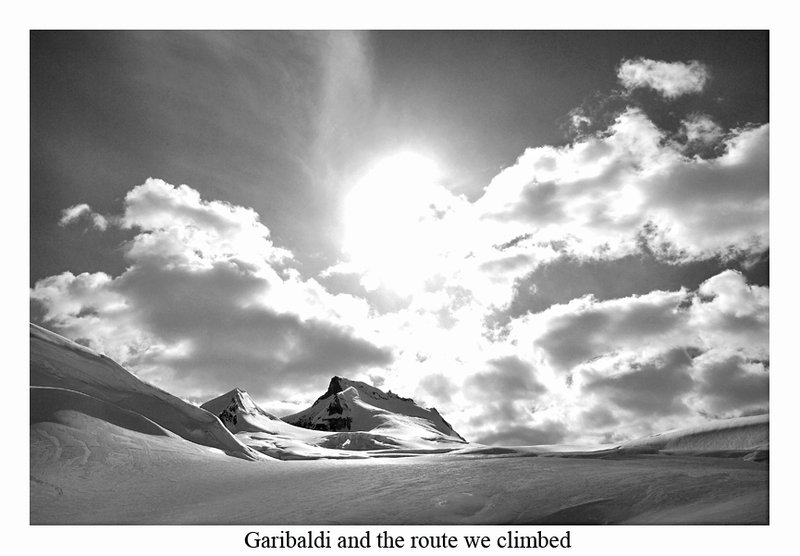 When climbing the snow ranged from hard to harder and the climbing steepened a fair bit, I began to feel the heart race. Across the way I could see Hannah and Amar, two dots and they, I'm sure looked back at three dots crampon and axe their way up, eventually to arrive at the small summit. It was the best one of the day. Going down, we were careful to watch out for the really icy spots. 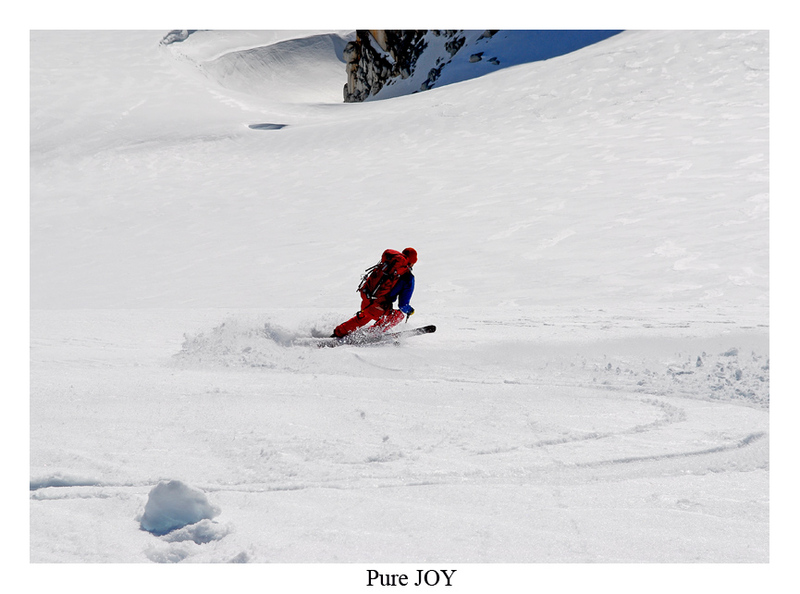 Gliding out into the center of the face, the snow, while hard, was very grippy. Perhaps Sky was right? It was good enough. While he swung down and away, one turn at a time, I took it slow and easy trying to catch a picture of the descent. The pictures didn't do it justice, but my memory will. It was a blast. 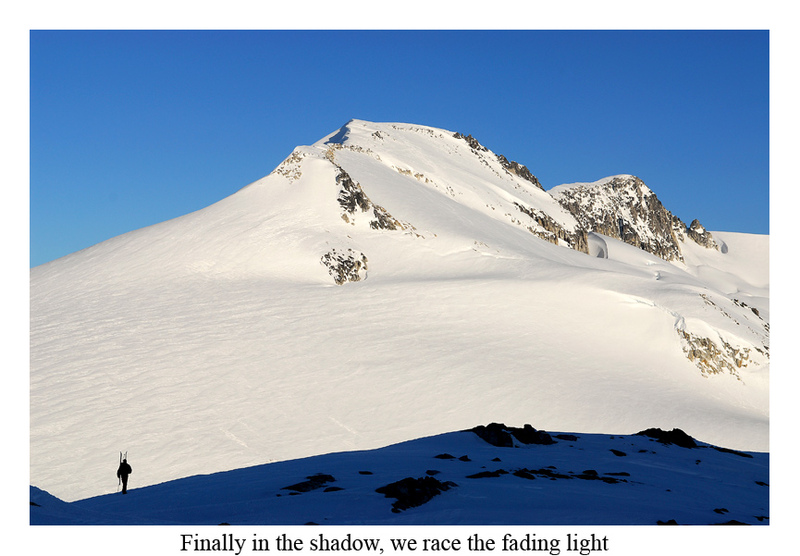 With the last few crevasses out of the way near the bottom of the face, I blasted outward from the mountain onto the glacier in a flurry of speed that carried me back onto the East Face of the Parapet. Beneath me Andy raised his hands, certainly pleased. I tried to yell, but the wind carried my voice away. 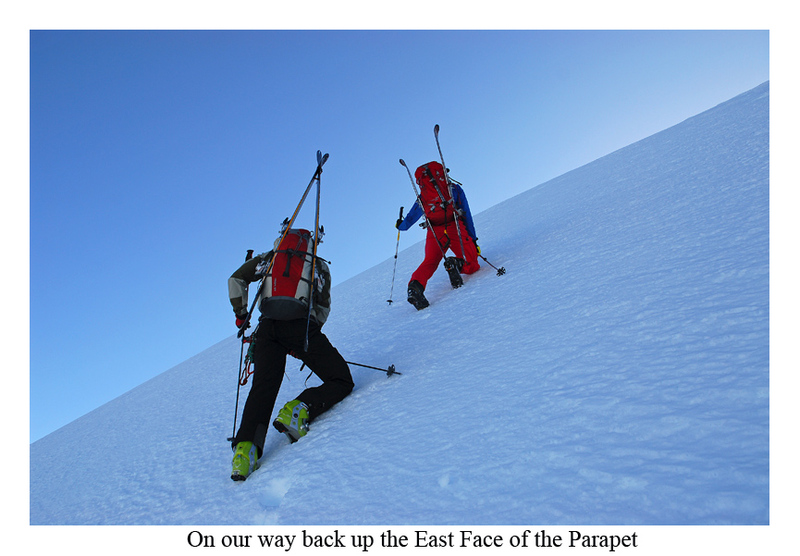 Forming up in a group again, we put our skis on our backs and raced up the mountain, reaching the top of the Parapet again in a short time. Like Garibaldi, I couldn't help staring back, not with a sideways look either, but with a gaze of appreciation for treating me kindly. 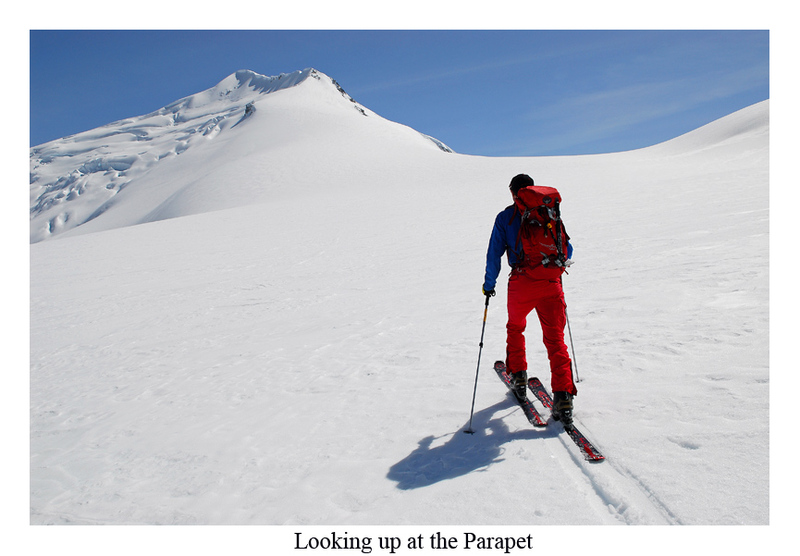 Taking our skis off, we now swept turns down the SW Face of the Parapet. These were the best. I tried to pull up for photos, but it was hard. 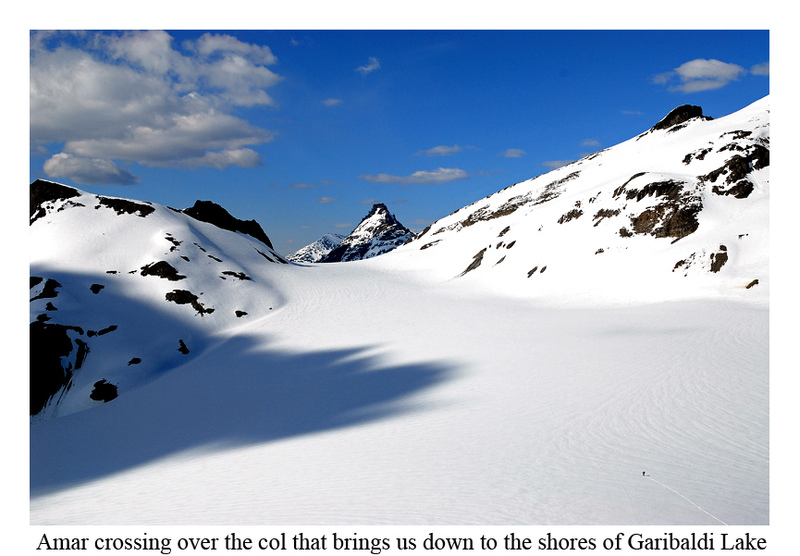 Those swooping turns were addictive and brought us down even with Gray Pass, which we traversed over toward. Above us our last climb remained. Instead of going to the summit of Carr, the way we had come, we decided to work our way up three giant humps on a ridge to a place where we could traverse over to the Bookworms and back down to the Sphinx Hut. 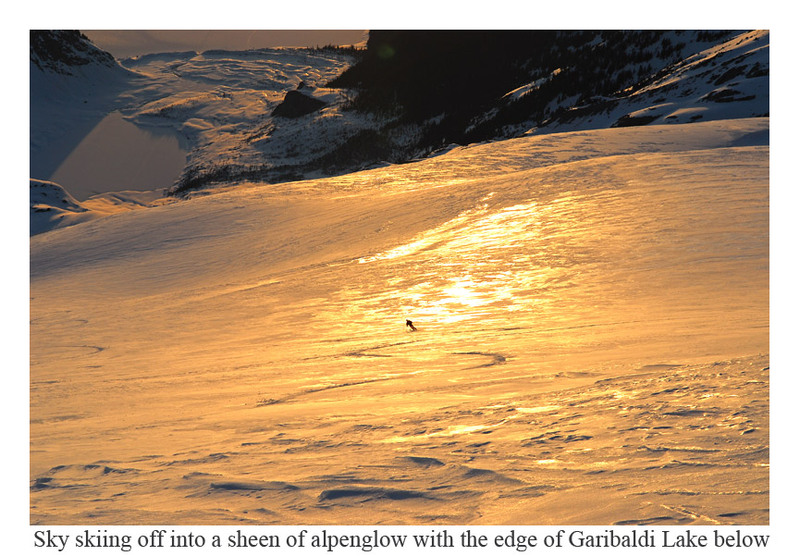 Only lingering whispers of pinkish light met us when we finished our last climb. A few stops brought us all the way back to the shores of Garibaldi Lake, satisfied. Andy, then, after a rest finished off his last 9 miles back to the car and his 6 o'clock appointment with work. I still have to check with him to see how that went. The 30+ miles and 12,000-ft had to be wearing on him. I'm sure he had no regrets though. He was still smiling at the hut. I told him, "Now you can really show those rando racers what it's all about!" My feet were done by this point. Sky and Hannah thought I should go climb the Sphinx. A bunch of them were going to go climb another smaller peak, but Lee Lau was heading in my direction. I decided to join him. Before long, he was set on going another direction. Since I didn't know when I'd be back, I was perfectly content with continuing. Near the hut I left them with my IPOD competing against the wind and the swish of my skins over the snow. Since I had no food and only a small bit of water, there was no reason to stop. Even with legs screaming, I kept pushing upward all the way to a pass several thousand feet above the hut. Climbing was fun from the pass. There's a steep bit of snow I should've put crampons on for, but didn't. A lesson learned I guess. Two whippets held me to the face and brought me to easier ground where I kept plunging through the crust layer and post-holing up to my knees. Up higher I climbed out onto icier slopes and booted to the summit, where all that I had done in the previous three days became visible. On the jutting summit rock I was able to see it all. What a great peak! From the top I descended the SW Face over a steeper headwall, different than what I had climbed (at which point I wondered if Sky had sandbagged the ski). Finding a way through that wasn't blocked by cliff, I happily finished it off by making a traverse to a lower pass over which the best snow of the trip greeted me. At the top I had put away my camera. This was my reward. Turn by turn in what must've been dozens and dozens on wonderful corn, led me all the way back down. I stopped at the creek and refilled my water, this time managing NOT to fall in. 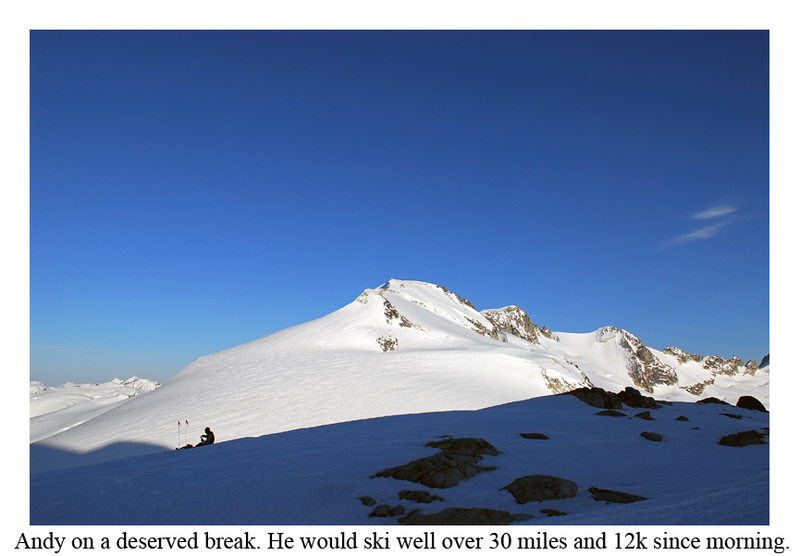 Lee Lau and one other were just leaving, having skied down from near Deception Peak. I packed quickly in the hopes of catching them. 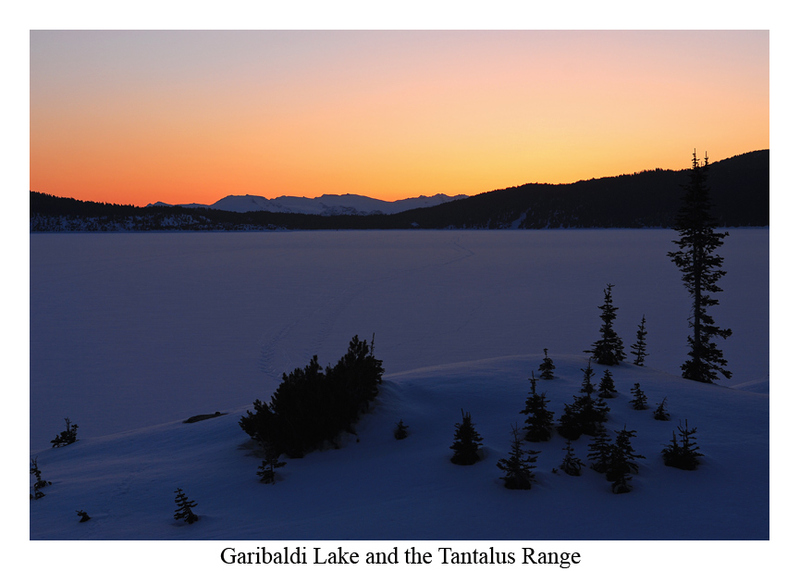 Perhaps 30 minutes later, I was gliding across the lake, my feet too hashed to skate ski much. At the outlet I climbed up to the trail and eventually caught up to the others at another lake. Down the rest of the trail was quick until we had to de-ski and walk the final few miles. Lee Lau is my hero for giving me a pair of slippers!!! Major kudos. While they drove off, I waited for the others. I was unsure if they'd be a few minutes or several hours behind. A few raindrops and a cool wind, along with the chilled water of the river where enough to keep me perfectly content.